Today we learn of news of Southwest’s changes to the Southwest Companion Pass, and how the needed 110,000 Rapid Rewards points are calculated, or rather, what points count, and what points do not count. I can’t say that this surprises me. While many would like to blame Bloggers for killing the deal, I would rather ask the question of Corporate Responsibility. Ok, so, lets think like a Southwest Rapid Rewards program executive. 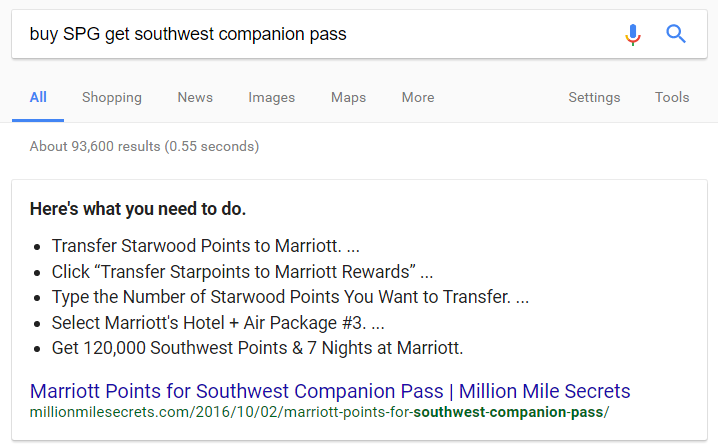 I’m seeing tons of different posts about how people can get the Southwest Companion Pass without flying my airline. I need to put a stop to this! I’m thinking that if such an executive were to believe this, that they would’ve made either (1) a no-notice change, or (2) an announcement now and change to come, right? No, instead, they choose to make the changes at the start of the new year. While this is probably logical, in that, it doesn’t hurt Southwest by leaving the door open until 1 January, it probably hurt others. Ok, that’s not necessarily the point I was getting at, but, let me play things out further. For example, Deals We Like blogged about how you can buy Starwood Preferred Guest (SPG) points at 50% off, and then transfer them to Marriott (getting 3 Marriott Rewards Points per 1 SPG point), and then get a Marriott Points and Hotel Vacation package, including getting 100,000 Southwest Rapid Rewards points. And Deals we Like is not the only one who blogged about it! Many discussed the idea of buying points specifically for the purposes of getting the Southwest Companion Pass. What I’m getting at is the fact that anyone at Southwest that saw how much press their Companion Pass was getting, would similarly see the different ways that one could accrue sufficient points to get that Companion Pass. It seems to me that it is very irresponsible of Southwest to make a change on 1 January, when in fact many people would have already made significant purchases in order to have sufficient points for the new year. So while we many will argue that Bloggers kill deals. But, on that logic, if the airlines and hotel companies are reading these blogs, then shouldn’t they be responsible too? Sure, kill a deal. But have some Corporate Responsibility. Don’t leave a deal out there until just before everyone wants to jump on it. Southwest likely didn’t gain anything by waiting. SPG-Marriott probably got a ton. Chase maybe even some, but Southwest, the primary offender in this case, got nothing. Whereas, they could’ve probably saved many people some angst by announcing significantly earlier. What do you think? Should Southwest get some of the blame here? I look at it from another angle. If someone already bought SPG points looking to get the Companion Pass and didn’t do it already, then they were being greedy by waiting until Jan. 1 to get 2 years instead of 1. If people had gone through the exercise in December and taken 1 free year of Companion Pass they still would have come out ahead. People are only angry because Southwest wasn’t going to allow greedy people to take advantage of them. If you don’t think Southwest was aware of the timing, then you are naive. Why do you think Southwest owes you some notice of a policy change that you are currently gaming and abusing? It’s in Southwest’s best interest to stop it today before it costs them a ton more money for letting people fly free for 2 more years. @Brad – you have your right to your opinion… But I’m looking at it from the perspective of – Blogs are open source, both sides see them. Both sides can see the advice being given, but only one side can make a no notice change that puts a lot of people in a bad place. Not sure whether folks were attempting to be greedy or just followed the advice of the blogs, or wanted to get best value. Fact remains, Southwest knew exactly what they were doing and it really seems to me, to be irresponsible. @Trevor – Why do you feel like you are entitled to notice of change on closing a loophole that Southwest didn’t want to be taken advantage of anymore? I can’t believe it was ever their intention to allow people to obtain a Companion Pass in this fashion and once Starpoints could be purchased at a significant discount it likely prompted a reaction. Who was put in a bad place? People made the decision to try to accumulate a CP through this loophole and they got caught. The points are still worth the same amount as when they were acquired as no devaluation occurred there. You acknowledged the answer to the problem……….”both sides can see the advice being given”, so bloggers need to be responsible in the advice they give and take some ownership when they give bad or risky advice. Don’t blame it on Southwest because some people took bloggers advice (yours included) and didn’t get the desired result. You are one of the bloggers, points gatherers, resellers, etc. that I think tries to do it ethically and doesn’t intentionally mislead people for your own personal gain. I just think you got this one wrong (and that’s okay, but it’s on to the next deal). @Brad – Maybe I got it wrong. But, I recall that when people realized that UR points transfers to SW counted, it got nixed very quickly. That’s what I expect to happen to true “loopholes.” But when a “loophole” lives on for quite some time, years in fact, its not so much a loophole. I feel like if something lasts more than a month, maybe even a few months, there should be some advance notice for changing it. United did that with their routing rules. Maybe I got it wrong. But, how many no-notice devaluations or changes have we seen in the last year? Its got to stop. Now I understand why you were so upset at the change by Southwest which prompted this post. You had plans to take advantage of the 2 years of Companion Pass and were originally shut out (until Southwest changes plans). Maybe you should have disclosed that you were mad because you had designs of taking advantage of the loophole before it abruptly shut? I guess it was just easier to blame corporate responsibility than accept the fact you got shut out because you wanted to be greedy. You just lost a lot of respect now that your hidden agenda is revealed. @Brad – I took advantage of it, yes. But I think we all had every reason to be upset with no notice changes. The only no notice changes I think I’ve let slide–and not written about–are Delta’s, and that’s only because they’ve happened so frequently that I think we are dull to them. The fact is, no notice devaluations or changes are unacceptable at any time for any airline/frequent flyer program/loyalty program/hotel. Thanks bloggers. You bite both hands that feed you. The banks and the airlines. By gleefully pointing out how easy it was to get. Trust me the best info I get doesn’t get posted. So bloggers you screwed yourselves out of referral bonuses by the banks first by making cards attractive and easy to get. Chase got even with you lol. Bet new customer #s are down. And the savvy travelers who don’t and didn’t need your advice will NEVER support you any longer. You all have a remarkable grasp of the obvious anyway. @Peter – hah… just for full disclosure… I don’t have any relationships with banks. Only shopping portals, Google and a handful of reseller related suppliers. I agree. It’s irresponsible for bloggers (corporations) to promote this option without sufficient warning about the potential downfall. Many corporations have been known to get commission from the sale of starpoints. All bloggers took the hard work out of the equation by spoon feeding the new wave of hackers with reckless abandon. Now since 5/24 and this down goes your referral monies. Can’t serve two masters. Just keep posting the obvious stuff that is old, repetitive and unoriginal. @Peter- have you read my blog much? I’m just curious, because your comments seem a little odd, if you’ve actually read past posts… but thank you for your comment, I do appreciate the feedback! I initiated a transfer yesterday knowing it takes a few days. This completely devastated me. I have no use for a 7 day Marriott stay. I wish the bloggers would actually help and call out Southwest publicly on the no notice change. I’m not mad about the change. It’s their program. But the no notice thing HAS TO GO. Everyone needs to stop being so greedy. Put yourself in the shoes of Southwest. Do you think they are in business to give you free flights? No, it’s a reward you should earn for frequent flying. I think it is said best above when you are naive if you think they don’t see what the readers have done. They have been extremely generous to let it go this long. So onto the next thing. Stop complaining and begin working on the next thing. Personally, five years of companion pass – saved us a LOT of money. Good luck to all and do not be greedy. @Dave- this isn’t about greed. This is about an airline disregarding common courtesy and responsibility in their change. Those mentioning Southwest not handing out free flights might also want to look at the fact that the people using the Companion Pass may not be flying at all without it. So it can be a form of price discrimination. It was in really poor taste to not give any warning…most people probably saw the changes coming anyway. My point of view, generally speaking, is that companies (airlines, hotel companies, etc) SHOULD generally give a reasonable amount of time for their customers before a devaluation. Mainly due to the wide range of customers they impact. However, my view is different when it comes to closing a loophole — I believe they should be able to do this immediately and with no notice. For example, if Amex wants to stop crediting MPX purchases as part of the airline credits… I’m OK with that. If I have no problem with what SW has done here — as long as they don’t disallow transfers that occurred prior to their announcement. What responsiblity does SW have to appease people trying to game the system — to the detriment of their company? Another point – these are not free flights. Chase is paying Southwest tens or hundreds of millions for their points and Marriott and hotels are paying Southwest millions to accept the hotel transfers (at very bad conversion rates I might add). So Southwest is being compensated considerably for every CP. THIS. SW may not make as much–does not make as much, of course–when other points generating organizations trade with them, or when CC companies buy points from them. But they DO make money. We’ve had about a year and a half of nice memories d/t our 2015-16 CP. The ramp up is on for the 2017-18 one, as the time wasn’t there for working on the hotel angle during quarter four. So this particular issue doesn’t affect me, personally. But corporations in general have forgotten that they have three discrete sets of stakeholders, and that it’s important to serve all of them: customers, employees and shareholders. It’s tiresome to watch the first two groups being more and more ignored in favor of the third. But not all customers, nor all employees are foolish enough to remain loyal to a company that is disloyal to them. Things change. People get smart. I welcome the wave of millennials who balk at 60 hour weeks for 40 hours of pay, and being expected to be on call 24/7, on top of that. The pendulum must and will move back. It’s to the benefit of the corporations to ensure that they find balance among their stakeholders before the pendulum swings too far.